July Favourites | Becky Alyssa's Beauty Box. 1. Vaseline Spray & Go Body Moisturiser in Aloe Fresh (£4.99 via Boots) – I’m not sure quite how I would have survived without this over the last couple of weeks. I’ve gone off the Radiant Cocoa version because the smell is a bit much over my perfume, but the aloe is ideal for the hot weather – cooling and soothing on overheated skin. This was a lifesaver after showering – spray all over, rub in and stand in front of a fan. You’re welcome! 2. Lorac Pro Palette ($42 via Ulta, no UK shipping) – My new favourite go-to palette. Few palettes have such a perfect mix of both mattes and shimmers in a super-slim palette that would take up minimal space in your travel bag. It’s not your typical neutral palette either, featuring the standard bronzes and browns as well as pink, mauve, white and a suit-all blue-silver shade – the matte white highlight shade has been a favourite for wearing on my browbone and the inner corners of my eyes, and the mauve shade makes an unusual and lovely crease shade for a subtle neutral eye look. And the formula – wonderfully pigmented, soft, easy to apply and blend. Brilliant value if you can get your hands on it! 3. MAC Pro Longwear Concealer in NW20 (£17 via MAC Cosmetics) – I’d had my eye on this for a while after reading some rave reviews on it but couldn’t quite justify the price for such a tiny little tube of product. Luckily my amazing mum treated me to one, since I’d been after it for so long. And so far it’s been perfect – brilliant coverage, zero creasing, spot-on colour match, and the tiniest amount goes a long way – I only need half a pump to cover up my under-eye circles. I can see this lasting a long time, so it’s absolutely worth the money! 4. Lush Sweetie Pie Shower Jelly (£3.25 via Lush) – I’ve already gone on about this lovely novelty product in my Lush Haul post & I’ve been enjoying using it so much since. Although crumbly & can be a bit of a challenge in the shower, it’s best used as a whole (ie. taking the whole thing out of the pot and using like a bar of soap..careful not to drop it!) or a small amount rubbed into an exfoliating cloth for a fragrant all-over scrub. It smells a lot like my favourite Lush scent, The Comforter, which isn’t readily available in shower gel form – fruity and delicious. After a good few baths it’s lasting well, so very good value for money! 5. Lush 29 High Street Perfume (unavailable online) – Normally Poole isn’t the most exciting place to live (although I do love the beach), but one of our town’s claims to fame is that it’s the site of the first ever Lush store! The tiny shop is a bit of a walk from the regular high street & it’s absolutely worth it to get hold of this ultra-rare fragrance! I didn’t buy it til now because I’d never given it a chance – smelling straight out of the bottle it has a very strong tobacco/alcohol/lemon kind of scent, which was completely offputting. But give it a chance – have a spray and leave it to dry down for 10-20 minutes – it then smells completely magical and only then can you truly appreciate this complex fragrance. Like an entire Lush store crammed into a bottle. Not quite sure how they do it, but I can detect hints of favourite scents like Karma, Flying Fox, Butterball, Creamy Candy..strange isn’t it! It’s funny how anyone else who smells it can also pick up on their favourites in there too. It’s very concentrated and only a spray or two is needed to enjoy this unique scent, so this tiny bottle (around £30) should last for a very long time. I’ve been mostly sticking to lighter scents at the moment but I’ll be all about this as soon as the temperature drops a little. 6. MAC Flamingo Lipstick (£15.50 via MAC Cosmetics) – MAC lipsticks have gone up by another 50p over the last few weeks; luckily I got this right before that unannounced price hike! Flamingo is one of those shades I never thought to try since it looks so incredibly neon and bright in the tube, but being a Lustre formula it’s much more sheer and glossy, coming out as a lovely & wearable bright red-pink summer shade that isn’t going to drain your face of colour or highlight skin discolourations, as neon lip shades tend to do. I can imagine this suiting just about any skin tone, pale or deep. Absolutely worth trying if you’re in the MAC store! Though I’m now going to put off buying more MAC lipsticks til I can go to the US where they’re a little more affordable. Those are all my favourites for July! Hope the first few days of August have been wonderful, and be sure to share your current favourites below! These were really good favorite that made want to go and get them now, especially the Vaseline Spray one…*hoping they have it here in Canada* hehe.. by the way, zoe’s post brought me here. Thank you! 🙂 I absolutely recommend the Vaseline spray, perfect for hot weather when the last thing you want to do in a home without aircon is smother yourself in suffocatingly thick, perfumed body butter. The next best thing to a cold shower! 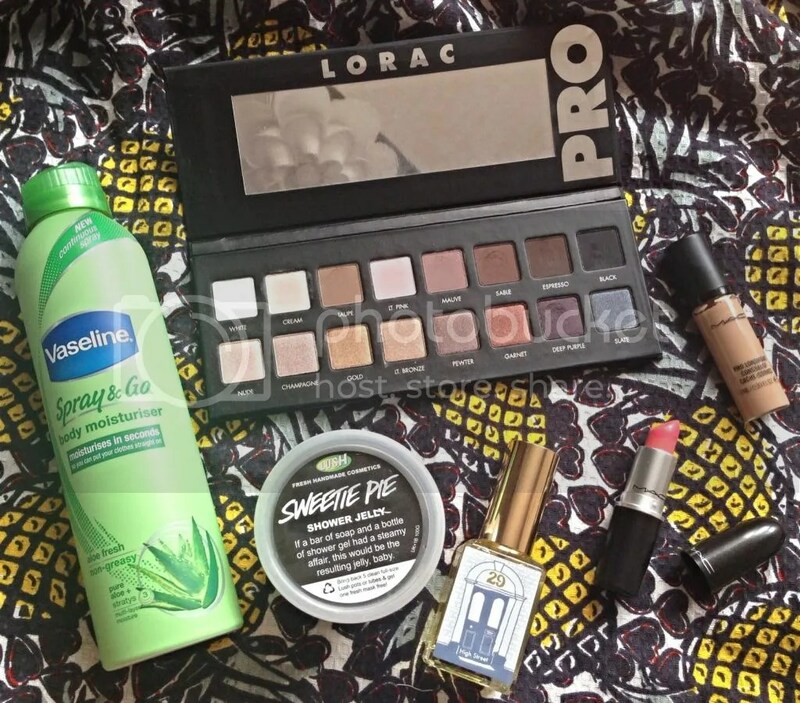 I like these products and the palette looks great and the MAC lipstick too. Keep up the good work.